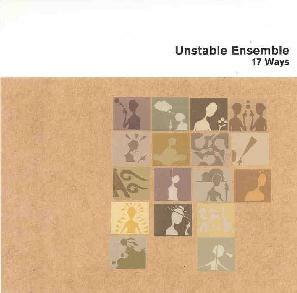 Unstable Ensemble - "17 Ways"
Unstable Ensemble is a free-improv quintet that stands out due to the prominence and interplay of duel saxophones and guitar as primary instruments. The band consists of Marty Belcher on soprano sax, Joe Donnelly on baritone sax, Jason Bivins on guitar and electronics, Matt Griffin on drums, and Richard Patterson on flute and electronics. Guitar, saxophone, and percussion are the main actors here, with the flute and electronics playing mostly supporting roles. Much of the music is characterized by what I call "quiet clatter", in which the full band is playing, but each musician seems to occupy his own unique space, jamming away with five individual statements that somehow seem to gel nicely with each other. But the band can also kick out intense high volume jams which finds the members creating a more sonic whole, reminding me a lot of W.O.O. Revelator, a band I've written about often in these pages. I really like Bivins' guitar which can rock out, but also displays avant jazz stylings and even some more abstract free-improv. Hot licks... but thoughtful and challenging. Belcher and Donnelly's saxophones can arouse a variety of feelings and emotions, and a couple tracks make heavy use of breathing techniques that downplay the traditional sound of their instruments. Overall, this is an impressive set that will appeal to fans of free-improv and more free-wheeling forms of jazz. At the time of this writing I just found out that Unstable Ensemble will be performing here in Columbus in July. I look forward to the live experience.